Too Many Cooks: Citrus Season is Here! So tomorrow is December. (Tomorrow!) This shouldn't surprise the lot of you that have somewhat regular access to calendars, but if you're like us, that sentence still makes your jaw drop a little. The holiday madness is quickly approaching (read: it's at a dead sprint, heading our way), but we're holding off for one more week. Soon this lovely site that we call home will be awash with edible gifts, holiday roasts, and too many cookies for us to reasonably consume -- but not yet, people. Not yet. Citrus season is here! What are your plans for citrus this year? Stephanie: Grapefruit! It's my favorite. I'm planning on eating it for breakfast all the time. 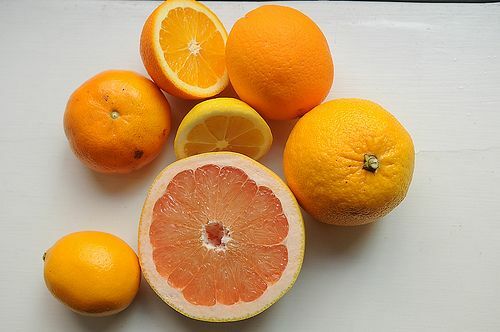 Christina: Plain jane ruby red grapefruit is a morning staple for me. And I go through bowls full of clementines. Lindsay: I'm partial to yuzu (in everything), but since I can't find them here, I'm going to have to second Christina! Marian: Boxes of clementines were always a winter tradition in our home growing up. The smell brings back lots of festive memories for me. Plus, they're tiny and adorable. Kristy: I'll be eating piles of satsumas and clementines all season long! I'll be making candied Bergamot, Rangpur lime, and mandarinquats. And probably a few lazy Meyer lemon tarts. And lots of preserved Meyer lemons. I love citrus season. Kristen: When my parents' Meyer lemon trees get going in Northern California, boxes full of lemons will start showing up at home and the office. Lucky Food52 staffers will get to help me figure out what to do with all of them. Karl: When I was lucky enough to have a lemon tree in my yard, making lemon curd was a tasty way to make use of a lot of lemons. Lately, I've been enjoying experimenting with citrus cocktails, like lime juice, tequila and hickory syrup. Jennifer: Every year the boys and I make pomanders to give as teacher gifts. The smell of the orange and clove makes the house smell so good. 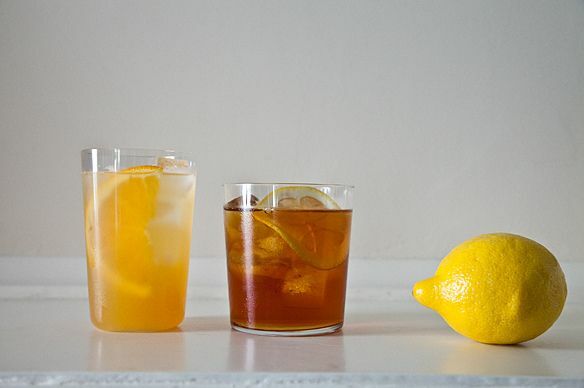 Veronica: I made a batch of lemon-thyme simple syrup for cocktails and I love pairing it with a squeeze of citrus to bring out the lemony flavor of the thyme! All I need is that Umami Mart cocktail glass and I'll be set. Amanda: When I'm feeling decadent, I make myself fresh-squeezed clementine or satsuma juice for breakfast. I love citrus, and ate it a like crazy when I was pregnant. One of my favorite citrus recipes is for Vin de Pamplemousse (Grapefruit Wine) -- it takes 40 days to make! I'm thinking about doing it this year with a mix of citrus, like Meyer lemons and satsumas. James: It's all about Morir Soñando. The Dominican beverage of choice. Maddy: I could eat my weight in orange-fennel salad and key lime pie (or any citrus pie for that matter, preferably mounded with meringue). Gheanna: Calamansi! We used to have trees in our backyard back in California. It's my favorite: perfect for a sore throat and for...all the time. Merrill: I resolve to use more citrus zest in general in my life this year. I haven't made Amanda's pasta with arugula, creme fraiche and Meyer lemon zest in WAY too long. Kenzi: I wouldn't be me if I didn't say I'll be using citrus in cocktails all season long. A favorite: grapefruit juice, gin, and a few turns of black pepper. Brette: To be honest, when it comes to citrus, I only really like lemon, and I only really like it when it comes with some combination of sugar and cream. Gheanna: I'm thinking a general citrus cocktail and pastry party is in order. Kristy: We're getting a party out of this!? Best Too Many Cooks ever! I still have orange pomanders that Kenzi and Camden made 15 years ago on display in my kitchen(and they still smell good!). Maybe I'll try it with Grapefruit this year! I'd rather be eating them but Grapefruit apparently interferes with many types of medication so I'll have to be happy with their aroma this year!! I love citrus season! Our favorite is the tangerine...but I have to second Jennifer...the clove studded pomanders are some of my favorite gifts! In Nigeria, Citrus season began in earnest in October though it never really goes away. However, as the year ends the oranges become much sweeter and the lemons more fragrant. This year, we've had really huge Tangelos (a cross between tangerine and orange) and some interesting thick-skinned lemons, including a really yellow lemon variety, which wasnt as tart as the regular lemon but nowhere as sweet as Meyers. I made a huge batch of candied peel once I was done with ginger lemonade and fresh tangelo juice. The candied peel is about to feed some Christmas fruitcakes - late for the cakes, I know! I too anxiously await citrus season in NY. I will be bringing back loads of Meyer lemons home to Nigeria after a pre-Christmas trip. Excited, as I tasted my first meyers ever only in June this year.